After working at Very Knit Shop today, I envisioned myself comfortably knitting while watching mindless programming. Instead, I decided to watch the 1984 American thriller, Body Double directed by Brian DePalma. The carefully executed use of recognizable Los Angeles landmarks added to the “layer upon layer” narrative. A “movie within a movie” reality captured through the lens of a camera. As I watched, I got the feeling there was another dimension to the story. 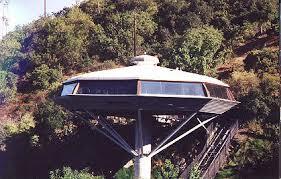 I was fascinated with the ultramodern house in the movie. Much to my surprise, the house actually exists, http://en.wikipedia.org/wiki/Chemosphere. The Chemosphere (1960) designed by John Lautner, http://en.wikipedia.org/wiki/John_Lautner brought back memories of watching the animated sitcom, Jetsons. Perhaps this is old news to many, but I enjoyed discovering something new this evening. The next time I visit LA, dinner at Spago’s, a visit to the Getty and I’ll try to catch a glimpse of the past.